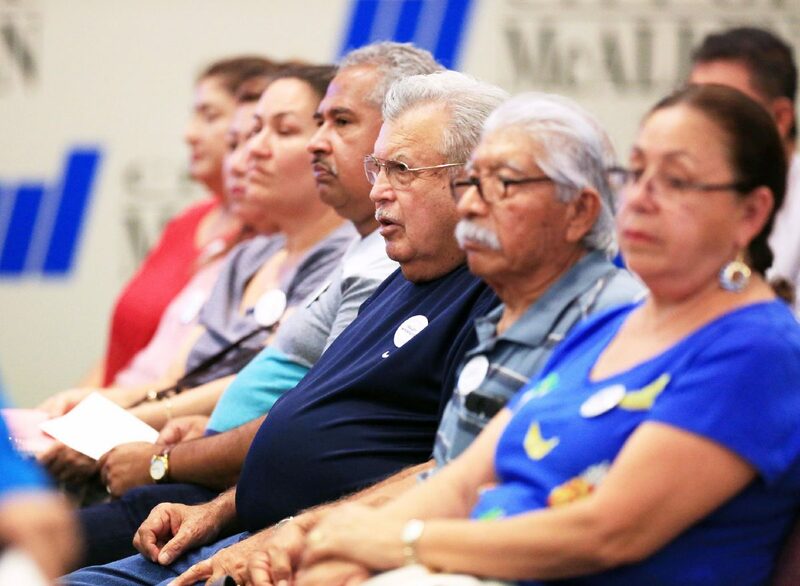 South McAllen residents attend an open city meeting to voice their concerns over drainage improvements to the southwest part of town at McAllen City Hall Monday, Aug. 13, 2018, in McAllen. McALLEN — Residents of South McAllen pleaded with city leaders Monday for help after rain flooded parts of their colonias in June. Before the June rains hit the Rio Grande Valley, city commissioners voted earlier this year to impose a drainage utility fee, which was implemented in March and was said to go toward drainage improvements across the city. That fee was implemented in March. In May, McAllen voters approved a $22 million bond in a May election for drainage improvement projects in the city. There will end up being 22 drainage projects stemming from that bond election, according to the city budget. However, Valley Interfaith organized a group of people living in Balboa, Hermosa and Idela colonias to plead with city commissioners before Monday’s commission meeting at city hall. City commissioners do not respond to public comments, but Mayor Jim Darling encouraged Lopez to set up a meeting with the city manager and engineering director. Lopez, for one, lost his 2008 Chevrolet Impala in the flooding, he said after publicly commenting to commissioners. Others in his colonia, and those surrounding, had their homes and cars flooded, Lopez said.